Application: Torx Plus socket screws with safety pin. A 5-flank TORX PLUS profile with a borehole. This drive geometry has only five flanks instead of the usual six and a borehole to protect safety screws against unauthorised unfastening. The screws cannot be turned with conventional, widely available tools. 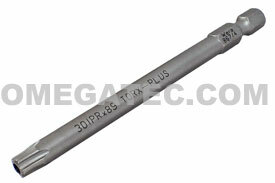 The 05134732001 Wera 867/4 IPR 1/4'' Tamper Proof Torx Plus Power Drive Bit with Bore Hole is one of thousands of quality tooling products available from MRO Tools. Please browse Wera 1/4'' Tamper-Proof Torx Plus IPR Insert Bits for tools similar to the 05134732001 Wera 867/4 IPR 1/4'' Tamper Proof Torx Plus Power Drive Bit with Bore Hole. 05134732001 Wera 867/4 IPR 1/4'' Tamper Proof Torx Plus Power Drive Bit with Bore Hole description summary: Wera 867/4 IPR 1/4'' Tamper Proof Torx Plus Power Drive Bit with Bore Hole. Point Size: 30 IPR Overall Length: 50mm / 2'' Shank Diameter: 6.0mm Quantity discounts may be available for the 05134732001 Wera 867/4 IPR 1/4'' Tamper Proof Torx Plus Power Drive Bit with Bore Hole. Please contact MRO Tools for details.